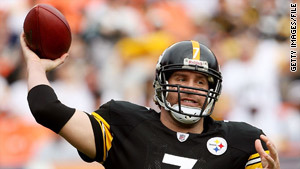 Pittsburgh Steelers quarterback Ben Roethlisberger is accused of sexually assaulting a woman in Georgia. (CNN) -- Ben Roethlisberger, the NFL quarterback accused of sexually assaulting a woman Friday at a rural Georgia nightspot, will be interviewed soon by authorities, police said Monday. "We anticipate interviewing him at a certain point in the next couple of days," Police Chief Woodrow Blue told reporters in Milledgeville, about 80 miles southeast of Atlanta. Witnesses were contacted over the weekend, and the lawyer for the 28-year-old Pittsburgh Steelers star has been in touch with authorities, too, Blue said. "He's in the process of making arrangements for us to talk to Mr. Roethlisberger," Blue said, referring to Roethlisberger's lawyer, Atlanta defense attorney Ed Garland. "The facts show that there was no criminal activity," Garland said in a statement to the media. "No sexual assault occurred. We are cooperating with the investigation. Ben is completely innocent of any crime. The truth of the events should cause this investigation to end without a criminal charge." Georgia Bureau of Investigation Special Agent Tom Davis said authorities were reviewing surveillance videos from nearby businesses in an attempt to determine what happened. He would not divulge what had been learned. He predicted a total of eight interviews would be carried out, "hopefully in the next two or three days." "It doesn't sound like they have probable cause to arrest yet," said Lisa Bloom, a CNN legal analyst. In a statement, the NFL said, "We have no comment concerning an ongoing police investigation. We will follow developments." Police talked to Roethlisberger, 28, and his 20-year-old accuser at the scene immediately after the alleged incident was reported about 2:30 a.m. Friday at the Capital City nightclub in Milledgeville, police said last week. The woman "alleged that he is the perpetrator," Milledgeville Deputy Police Chief Richard Malone told reporters. He said that the woman was part of a group mingling with Roethlisberger's friends at the restaurant and that the group had gone to other bars and restaurants Thursday evening. He said the woman was treated at an area hospital Friday morning and released. Roethlisberger has been the starting quarterback for the Steelers for six seasons, guiding the team to two Super Bowl championships.